Recap: Had been a car person all my life, but due to the needs of my MBA program which required travelling a lot for research purposes I bought a Yamaha FZ16 during Oct 2009, that is when the Biking bug bit me started off with long rides and everything including ridign gear etc. Started saving up for a bigger bike in my job years, after the money was saved the proposal was shot down by me parents so bought an XUV at that time. Coming back to the present, the biking bug laying in a dormant condition from the past 3 years started to rise up again after a visit to the Benelli showroom and hearing the TNT300 for the first time (man that is one sweet sounding machine), but thought of first getting the permission from my parents before starting a savings account again for the big bike, surprisingly this time it didnt take any effort from my side to convince my dad of the big bike, the only condition was no sportsbike which I was fine with as the riding posture of the sportsbike would have killed my back anyways, so started looking for something comfortable in an entry segment premium bike range, couldnt even think of going all out and buying the big 1000s. During the search had a look at the Benelli TNT 300, 600i, Yamaha R3, Triumph Bonneville and the Harley Street 750. I was **** bent on buying the R3 or the TNT300 as the rest were a bit out of my budget and the Bonneville was way out of my budget even though it is the best bike in the above. Had also considered the Kawa Z250 and the Honda CBR250 but those bikes never really felt like an upgrade. After the launch of the Yamaha R3 went to have a look and get a feel along with my wife. the bike is really good looking, sounds good although there is just one issue for married guys the pillion will have to do a small rock climbing exercise to get on which is not good for husband's health later on, similar was the case with the TNT300 and the 600i. My Harley story: this story goes way back and let me tell you I had always hated the Harleys, way too shiny for me. then one day a friend of mine Harish told me about the Street 750 and its riding dynamics plus it came with an all blacked out treatment, so decided to at least have a look at it, went to the showroom 35kms from my place on the other side of town, took a test ride and was blown away, it didnt sound like Harley at all. this was back in December 2014. Coming back to present after the disappointing pillion foot rest height of the TNTs and the R3 my wife pushed me on for the Street 750 at least to have a look and see if we can manage the budget. She was also the one who strongly supported the Street due to height, and plus she thinks that it is more stable than the R3 (I might have to do something with it). but as it was out of my budget I again pushed for either the TNT300 or postponing the bike puchase for another year or two. I think that might have pushed my wife to seriously consider the Street and literllay pushing me to buy it. So we decided to book it in Jan 16 as there is a 2-3 month booking period on it and the finances would be ready by March 16. Now like a true petrolhead I started researching on it, the rides, reviews, mods etc. etc. it became my wallpaper on both laptop and the phone, couple of more visits to the showroom pestering the Sales rep with queries etc. Come October 15th I was doing my work at night and my wife was smiling suspiciously at me so out of curiousity I asked her whats wrong to my big suprise she said that she was planning to surprise me on my birthday by booking a Street and that she was planning to go alone and book it but she decided agaisnt it as my brother told her to take me along. I said WOW!! So next day on my birthday I picked her up from office at 7 PM but since it was already tool late to go to the showroom on the other side of Pune as they close at 8 I told her lets do it the next day. Again to my surprise she told me she had called ahead to the showroom and have asked them to keep it open for us a little bit longer. Finally we reached the showroom at 8:45 thanks to Pune's traffic and booked the Street 750. Hats off to the Sales Rep Raj and his manager Jitesh for staying late. The delivery has been promised for first week of November. The wait is just killing me, trying to get my loan sorted out in the meantime. Naming the bike was not that hard this time around, Its Red, Its a HOG, its big (for me) and I have an Orange colored FZ, so naming both the bikes as Timon and Pumbaa. 21-10-15: trying to get a loan for the Pumba from HDFC man thats a lot of documents. Also had a chat with the Harley rep on accessories, for the time being I have decided not get anything Harley as they are over the top expensive, a backrest assembly costs more than 30000, and an engine guard 16000. 25-10-15: 12:30 in the night and still cant sleep. reason? finalizing the loan tomorrow and a longer test ride is planned. trying to check out the reviews and opinions online. not much available from Indian users. 26-10-15: Took a long test ride yesterday almost 7-8 km on the Street 750. Rode the bike in heavy traffic, open and empty roads with a couple of U turns. Also got asked the usual kitne ki hai and kitna deti hai questions at one of the traffic lights. the bike inspite of its weight and size is easily manoeuvrable in the traffic. The bike is super comfy in Indian road conditions, takes in the bumps and the cracks very easily without any nautankis. The engine is torquey. Have to be real careful in traffic, slight movement of the accelerato pushes it forward like a frieght train. The horn is a bit weak though. Found the brakes to be adequate for 70-80kmph. Have also finalised the Loan from Vijaya bank, where in they are giving 10.5% for a max tenure of 7 years without any foreclosure charges, although they do have a 5000Rs processing fee. Cant wait to get my hands on the machine. 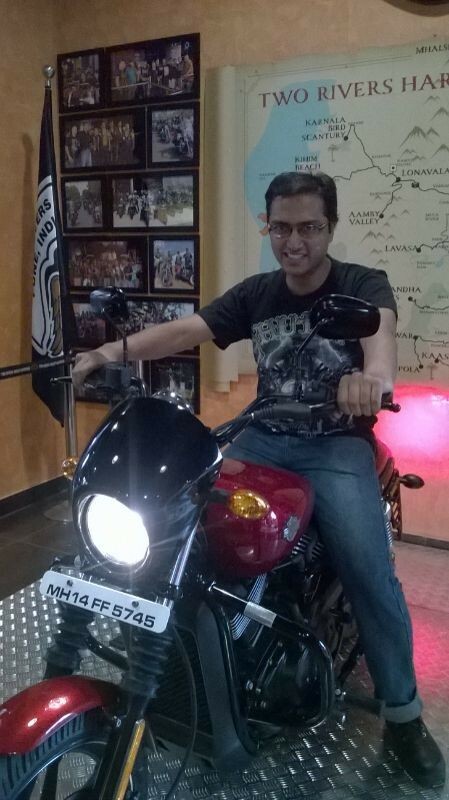 Hats off to the Harley sales team for arranging and an awesome Delivery experience. they also gave a Harley and a Two Rivers badge to be put on my Riding jacket. Along with a sling type Bag and a box of Ferrero Rochers. Rode back to Home around 35km in heavy to moderate traffic. The bike though oil cooled heats up a bit in slow moving traffic and at signals. Did get a lot of second glances. reached home, Mother and wife did a small pooja at home itself. the bike is really easy to ride and maneuver in traffic, slight twist of the throttle and the traffic is left far behind. Street 750 doesnt sound like a Harley though but I dont really care about that. Might think of an upgrade of exhaust to Screaming Eagle in sometime but nothing as of now. Just got the motorcycle fitted with an Engine Guard so as to protect from minor falls during the initial periods. One thing that is a huge let down is that I got cramps in both my legs after 45 minutes of riding, maybe they will go away after sometime. Pumba has come home and has crossed the 250km mark at the time of the post. It also had its first refill of fuel. Giving an average of 19.5kmpl in bumper to bumper traffic. Attaching a pic during delivery. rganesh67, meph1st0, Solo750owner and 1 others like this. Hi ! I am also from Pune and will be booking the Street in the first week of December. Have also taken 2 test rides and am happy with the bike. I have one query though. If you are riding pillion with your wife, how comfortable is she on the pillion seat ? I am asking this because when I was sitting pillion I found the seating position with respect to the foot pegs to be a little awkward ( uncomfortable ). I am 5'7", wife is 5'1". So.... should it be alright ? Kawasaki's imminent launch of the Versys 650 has put me in a dilemma. That is much better suited for long distance riding but am worried about the seat height of 84 cms. For a heavy bike both feet have to reach the road comfortably for maneouvring . Hello Lubree, Yes that should be fine, I am staying in Dange Chowk, feel free to drop by if you dont want to go to Amanora. Your wife can even have a chat with my wife, although she hasnt sat much on the bike till now. Versys 650 and Street are totally different species. I think it will also be more expensive than the street. I am still not sure why the tourers are considered better suited for long distance riding. and 84cms ride height with a heavy boke might prove dificult. My thoughts exactly. The Versys is going to be expensive, maybe around 650000 to 700000 INR. But as I said, am apprehensive about pillion comfort. Hello Lubree, I dot think here will be an issue in long rides for 5'1", plus there are a lot a of seat options available even in India for the street. Got the motorcycle back from the first service. total cost 6070, this included 2200+ for the oil, 2500 for the first service some taxes, consumables at 500 and an o ring and a seal aty 35 each. Also got the Oil leakage fixed, according to them the issue was because of the o ring in the Neutral gear shaft. 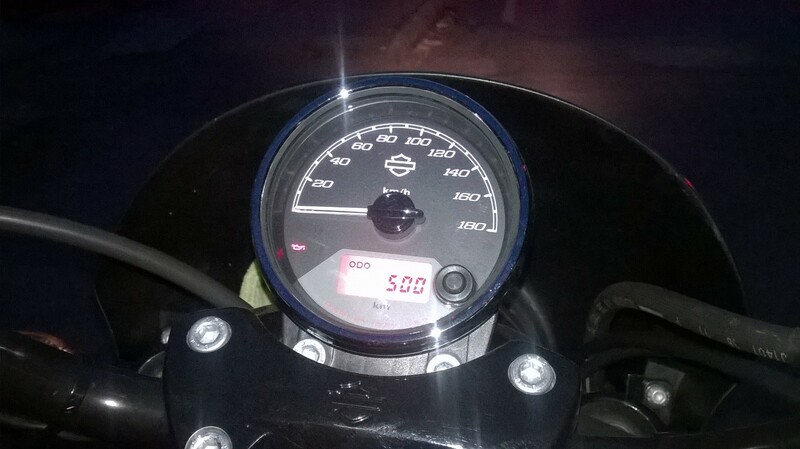 Pumbaa also completed 500kms today. Congrats Kinshuk on your new acquisition, saw your thread only now. Good that you got crash guard, note that side stand is not of great quality. You have to really careful while parking if surface is uneven. I would also suggest a pillion backrest incase you do two up riding. Thank You meph1st0. Pillion backrest is in the list but since right now I am not taking any pillion it will take some time to get. The cramps have gone after a slight adjustment in the riding posture. Side stand seems fine to me. Planning to get the seat from Sandeep Dahiya.